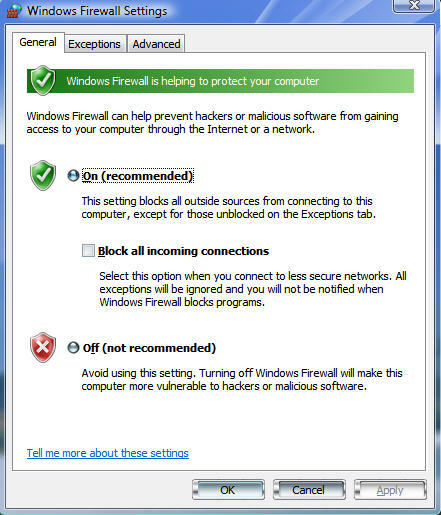 "Windows Vista Firewall: The Needed Settings to Protect Your Computer!" Windows Vista Firewall goes well beyond the XP version because in XP only inbound traffic is blocked, allowing outbound traffic to go unmonitored. 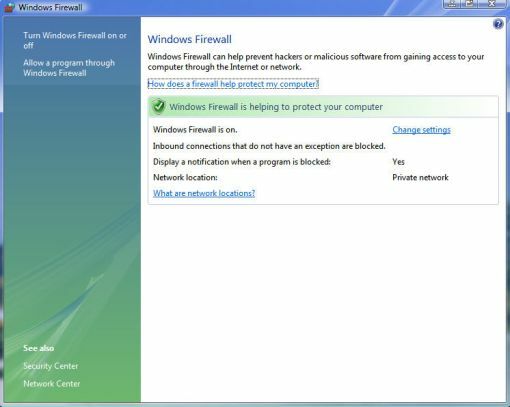 With Windows Vista's improved firewall, you can block outgoing traffic, too. And because it's integrated so deeply into the system, it can prevent Windows components from sending data out over the network if they're not designed to do so. This should prevent problems that arise when certain Windows components are replaced by malicious code. From the Start menu, click the Control Panel. From the Control Panel dialog box displayed, click the Security option. Then, click the Windows Firewall option. This will display the Windows Firewall window and we can start to change the settings. 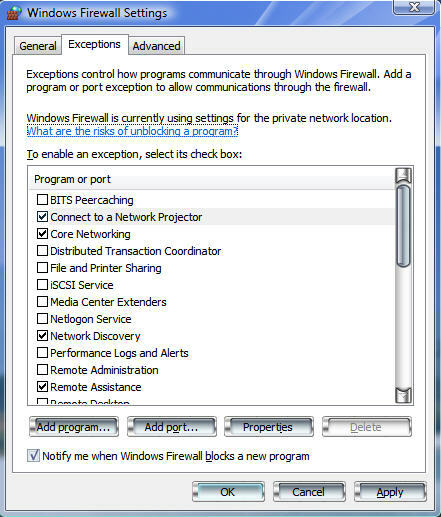 Selecting the Change settings option displays a three-tabbed Windows Firewall Settings dialog box. From the General tab, you can turn your firewall on or off and select the Block all incoming connections options. The Exceptions tab lets you quickly select which programs are allow through the firewall. If you are unsure as to what a certain program does, you can select it and click the Properties button. In the Advanced tab, you can choose the network connections you want to protect and restore to the default settings by clicking on the Restore Defaults button. Once finish, click the Apply and follow by OK button.